You might be someone who is only exposed to sweet potatoes when the holidays are here. Well its time to get educated and try some delicious sweet potatoes. These are sweet potatoes. 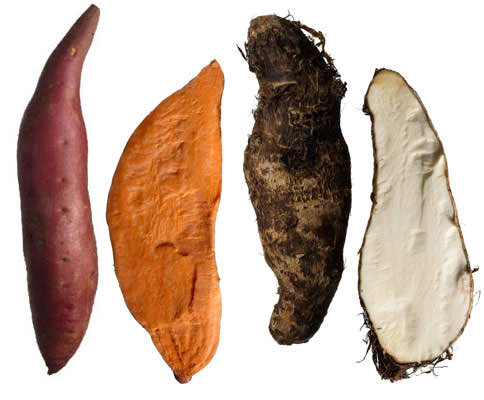 At the top we have a red/orange sweet potato and below that are two white sweet potatoes. You can make some great things out of the orange variety. Unfortunately it is often served with marshmallows and is sickly sweet. I’ve got a great sweet potato casserole recipe that you will love. 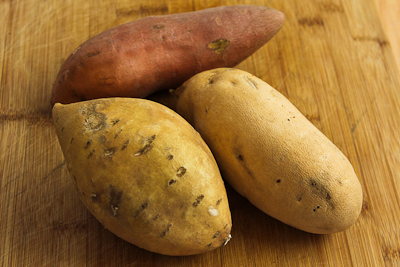 Now the white sweet potatoes make an absolutely wonderful mashed potato. They are less sweet than sweet potatoes but still quite sweet compared to the standbys of russet and baby reds. On the left here we have the red/orange sweet potato. On the right, will this funny looking thing is what a yam actually is. Yams grow on trees and can get to be five feet long! Most people have likely never seen a real raw yam.